3 Dash Cam Apps For Android, Compared: Which One Can Protect You Best? Interested in getting a dash cam? Whether you want an extra set of eyes in the case of an accident, or you’re just curious about your own driving habits, there’s no doubt that having a dash cam can help you Can Dashcams Stop 'Crash For Cash' Fraud? Can Dashcams Stop 'Crash For Cash' Fraud? The car in front of you suddenly brakes without warning... and you plough into the back of it. Read More . If you’re not sure you need a dash cam at all, watch the following video. It’s a news story about how prevalent dash cams are in Russia due to insurance fraud and police corruption. It might just convince you that having a dash cam is a good idea where you live too. 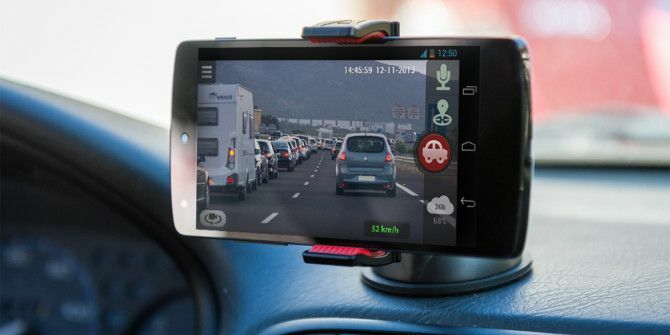 But should you spend a few hundred dollars on a stand-alone dash cam or should you use the camera and GPS device you already have – your Android smartphone? I’ve set out to test three of the most popular and well rated Android dash cam apps to let you know what I think of them. The equipment used for testing was my Samsung Galxy SIII running Android 4.3. For the cellphone holder, I used a generic clamp-style suction-cup window mount, like the one pictured below. The phone had to be slightly offset from being centered in the clamp, to avoid the clamp taking up the shot. You may notice a black object in the top-right corner of the videos. I believe this contributed to the vibration of the whole rig. That was countered by wedging the phone and clamp up against the rear-view mirror. Not the best fix, but a suitable workaround for the test. The holder is excellent for its price, but not recommended for recording video. Each app was used for my 45 minute commute in the morning, late afternoon, and after dark. The video after dark was pretty much useless for all three apps, so it isn’t included here. From what I’ve seen on YouTube of dedicated dash cams, unless you’re driving in a well-lit area at night, the video isn’t that great either. My test videos and dedicated dash cam videos all look pretty much like the one below. Since my commute is so long, I did cover a variety of road surfaces as well – brand new roads, pot-holed asphalt, even roads that might be classified as dirt. This helped to determine how stable the video was. As long as the mount was rigid, the video quality was appropriate for the type of road traversed. Parts of the commute go through rural and urban areas, so I was able to assess how the dash cam apps performed in these environments as well. I can say that they all performed equally well and were able to take readable video of license plates just a few meters ahead of me. In order to avoid any legal issues, I didn’t include video from the urban areas in this article. People get funny about being recorded on a camera. For power, I used the phone’s AC charger plugged into an inverter. All three of these apps use a ton of power for video recording, so I advise that you do the same thing. Also be prepared for the fact that your phone may heat up a fair bit. The heat level wasn’t high enough to affect my phone, but if your phone model has a record of overheating, you might choose not to do this. I believe that in the summer when I have the AC on, the heat would not be an issue at all. CamOnRoad is a solid app for use as an Android-based dash cam. The interface is very simple and intuitive, and setup is a breeze. Plus, they offer you 2 GB of free, permanent cloud storage for your dash cam video. According to CarOnRoad, that could be up to 3 hours worth of video. The application is set up to upload your choice of videos when there is a WiFi connection available. So, if something happens to your phone, at least there’s a chance you’ll still have the video. Additional features are very simple and easy to configure as well. You can choose to track GPS information such as your location and speed, and CamOnRoad will attach that info to your video file. When you play the video in the app, the date, time and your speed are overlaid on the video to help confirm when you were there and how fast you were going. There were only a few issues I found with CamOnRoad. There are a couple settings that are still written in Russian. This is a minimal issue and will most likely be updated in the near future. The final issue was that it recorded sound whether I turned that option on or off. That might not bother you, but I tend to sing along with the radio, poorly, and that’s not what I want people to remember if they find me dead in a car wreck. Minor issues. Recommendation: Good. If you just want a straightforward app to test out if this dash cam thing could be for you. It provides all the basic information that might help you to fight a frivolous insurance claim or a traffic ticket. CamOnRoad has the right price and the essential features needed. Definitely a good entry point into the dash cam world! The Free version of AutoGuard does all the basic things that you would find in CamOnRoad. It records video and sound, incorporates location and speed from GPS information, and overlays date and time on the video. Understandably, the free version also has ads in it. That alone is worth paying the $3 bucks to upgrade. However, the Pro version adds so much more. It also uploads videos direct to YouTube. 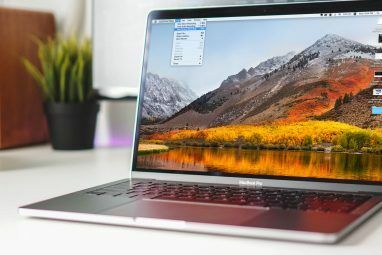 It can start recording automatically when your device is docked or connected to a Bluetooth device that you assign, provided that it is still running in the background. This does mean that if you plug it in to a wall charger while AutoGuard is running in the background, it will start recording. AutoGuard can also capture still pictures in important situations such as hard braking or impact, and has One Button Emergency Call. The One Button Emergency Call could be a real life saving feature, as you only have to hit the button on the screen to call emergency services and you can set what number to call. Definitely a worthwhile feature. Recommendation: Better. For less than $3 you get the equivalent features of a dedicated dash cam with the potentially life saving One Button Emergency Call feature. If you want to use your smartphone as a dash cam, this is the one that I would recommend to the masses. You’ll get decent video evidence for protection against traffic incidents, and easy access to help in the case of an injury. Pretty good protection. CaroO Free is a well-equipped free dash cam app, offering recording in 640×480 pixel and 720×480 pixel resolution, ability to control focus and exposure, trip data, and an emergency call and SMS button. The emergency call and SMS button can be set to whatever number you prefer. You can also choose to save to the phone’s internal memory or to an external SD card. That may be a good idea in the event of a crash where the phone becomes damaged. It is a bit easier to use than the other two apps as it can be set to start recording when you start moving and to stop recording when you stop the car. You can also set it to start recording as soon as you connect your phone to the charger. Like AutoGuard, if you have CaroO set to do this, it will start recording if you just plug it in to a wall charger. Something to be aware of. For even more flexibility, you can configure two quick-start buttons to run whatever program you want when you touch them. Perhaps your phone’s GPS program or Google Maps would be a good choice. You can even set an over speed warning to pop-up should you exceed the maximum speed that you set for yourself. Obviously CaroO has a lot going on, and a lot going for it, so give it a shot. If you do, you may well consider upgrading to CaroO Pro for its amazing car monitoring capabilities. 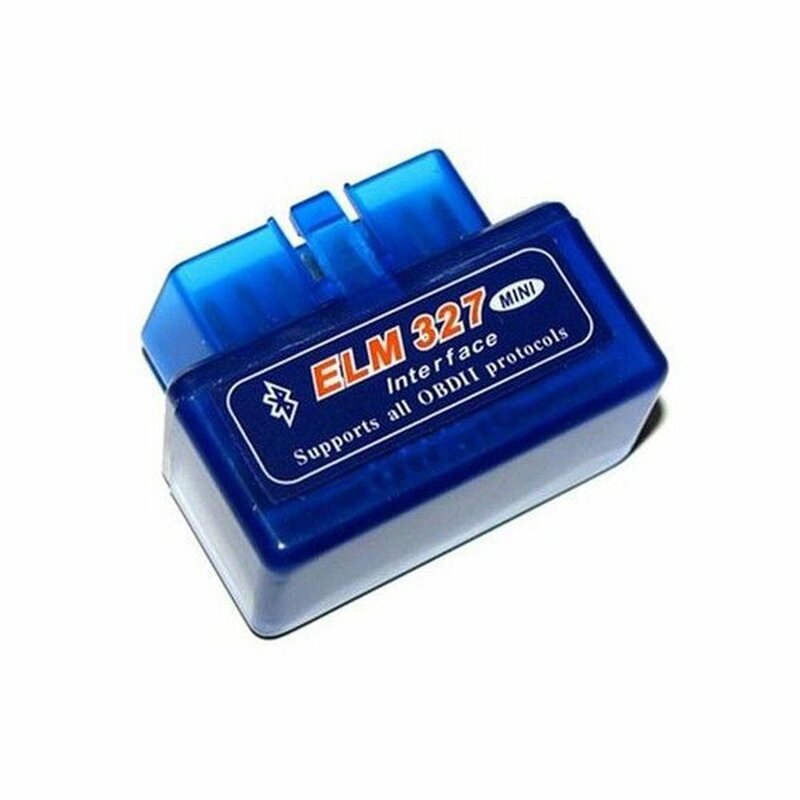 If you’re vehicle is OBDII compliant and your phone supports Bluetooth, you can get a Bluetooth OBDII reader, plug it in to your car and monitor all sorts of things about how your car is running. You can track battery voltage, running temperature, fuel economy, fuel consumption, and any malfunctions that might occur. All that information gets stored in the CaroO Pro application so you can review it later, or share it with your mechanic. If you’re not sure what OBDII is, the OBD stands for On Board Diagnostics and the II or 2 stands for the second version of the standard. All cars made since 1996 are OBDII compliant, but may have slight variations. If you’d like to know what variation your car has, this page on OBDII Protocols for different car makes will help. I didn’t have a Bluetooth OBDII reader to test the app with, but after testing it in so many other ways, I’m going to get one just for this. They can be had for $10 to $20 on Amazon. My concerns about the CaroO app are pretty insignificant. There are several spelling mistakes in labels and instructions, but that’s not a big deal. The user interface works just fine, however I find some of the buttons on the small side for my stubby fingers. Very minor issues indeed, and updates are frequent so expect those complaints to be addressed. Recommendation: Best. CaroO Pro does more than most dedicated dash cams and for a fraction of the price, so this would be a great choice for the person who wants to know what happens around, and in, their car. All the features of the other dash cam apps, and a vibrant online community on Facebook make it a no-brainer. You get all-around protection in the form of the video evidence, the emergency call button, and the information you need to protect your car’s health. With a solid, stable smartphone mount, any of these Android dash cam apps is worth using. Find the one that works for you and your car, and let us know how it goes. Have you got a dedicated dash cam? Have you compared it to a smarphone app? What did you think? How about your own dash cam videos? If you’ve got one you’re proud of, why not share it with us? Image Credits: CaroO OBDII Screen via CaroO, OBDII Bluetooth Reader via Amazon, CamOnRoad on Dash via CamOnRoad. What about Android app. : DashCam Travel? It's new and it has nice user interface, loop recording, background recording, auto-start etc.. I am using everyday. I recommend. I've been using Car Camera for the last month. I think this one is new on the market and it's paid. Clean interface and it does what it should. I recommend. I have been using an app called DailyRoadsVoyager for years now and love it! It has tons of options, can record in many different video formats and works solid on my cheap, $20 Android phone. "For power, I used the phone’s AC charger plugged into an inverter. 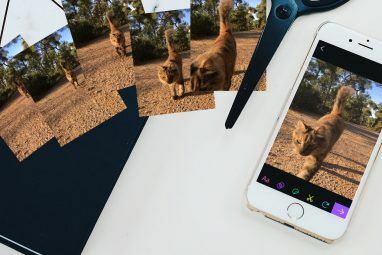 All three of these apps use a ton of power for video recording, so I advise that you do the same thing." An inverter will take your car's 12V DC power supply and convert it to 110V AC (or 220V depending where you are). Plugging your phone's wall charger into that will then convert the AC supply down to 5V DC, as required by your phone. This is quite inefficient and adds another point of failure to one's recording setup - indeed, probably the most fragile of car electronics is the DC-to-AC inverter, if buying on the cheap. Better to cut out the inverter entirely and instead buy a DC car charger that can supply sufficient current to a phone that's drawing a lot during recording use. This typically won't exceed 2.1A, so find a 5V 2.1A charger and you'll be set (or buy the phone manufacturer's own brand of car charger, which should supply precisely what your phone needs, even under heavy load). Note, some phones require 5.1V or 5.3V (and sometimes even other voltages) so look at your wall charger to see what it lists as 'Output' and look online for a car charger that has the same specs. The voltage needs to be the same but the current (Amps or milliAmps) can be equal or greater. Is there an DVR app that can record from the both cameras of the phone ( front and back ) at the same time ? I can get Caroo to record for a few seconds, then it closes the entire app. Read all 56 pages of manual. Your best bet is to contact the developers at CaroO for help. Hello, I'm looking for a dash cam that records front and back simultaneously, and has a button that when pressed will upload to the cloud the most recent 15 seconds as well as the next 15 seconds. I don't know. If it does, it's probably a dedicated dash-cam and not an Android app. If it doesn't exist, maybe that's your new business! Caroo wouldn't work on my HTC m8. Just says caroo stopped when I open it. Real shame as like the idea of obd. Now using camonroad and looks good. CamOnRoad is the best one I've used so far. Not only is it completely FREE but you can turn the screen off and it will still record, and every option in it is available. It also records audio by default. I used the free version of Autoguard before and audio recording, recording with the screen off, and nearly all options in it are only available in the $3 "Pro" version. Also if playing music via bluetooth off my phone in my car, it was constantly pausing and skipping. There's lots of complaints on the Google app store about Autoguard (both free and Pro versions) freezing/crashing too, which I saw it freeze and crash a few times when I used it. CamOnRoad hasn't frozen or crashed on me once, and it works great. I download the caroCaro free app. How and where do I turn the dash cam on. Can not find it to save my life. Is the dash cam only available in the pro version? It's available in the free version for 100 recordings. In the settings menu, there should be some help files. The layout of this app has changed drastically since I wrote this article in May, 2014 so I'm not completely sure where things are now. I believe it also had the capability to start when your car was in motion. Don't quote me on that though. "I believe it also had the capability to start when your car was in motion. Don’t quote me on that though." Did you continue using a smartphone as a dash cam? If so, which was eventually your preferred app? I seldom use the smartphone as a dashcam. A dedicated dashcam is much better in my opinion. When I do use the phone as a dashcam, I use CaroO Free. Not really sure why. It's just the one I kept on the phone. Having a hard time finding an app that will record on front & rear cameras simultaneously. You can buy a two camera dash cam but still no app for dual recording. Wondering if we can use an external camera with wifi or bluetooth to the phone with a dashcam recorder. Thay way you mount the camera and keep the phone off the hot windshield. I haven't seen it yet, but that sounds like a good idea. Fill your phone with a large microSD card, have the video stream into that. Then in the case of a traffic incident, you'd have it on your phone, not the camera that got damaged in a crash, or grabbed by an angry person. I can not get Auto Guard's .GP video to play on my windows 7 computer, it's not supported. I even tried Oxelon video converter, not supported. Can anyone explain how? I also can not even find Cam on Roads files on my sd card of the phone. About AutoGuard's .GP video, do you mean .3gp? If it's .3gp there should be several players you can download that will run it. DAILY ROADS stops recording when my phone locks and screen turns off ? Hello, Daily road is a great application but can you confirm that it is because of my mobile that it stop recording when screen turns off and locks ? I have a Samsung Galaxy Prime duos and I want to use the minimum battery to record long time when my car is parked, how can I do ? Got AutoGuard on my phone and it is worse than useless. Nice 'Feature' list, looks polished and seems to be working fine until you need the video when you find the video is corrupt. While the video before and after are ok.
Torque and Dash. I'll have to check those out. Maybe another round-up of dashcam apps needs to be done in a few months. I have been looking into different dash cams and one site recommended one for thirty dollars, but it seemed like every device had some limitation, and only one was rated for our Arizona summers. Then I wondered about apps and found your page. There is a version of AutoGuard called Blackbox that does full HD and CarO says that it does full HD if the camera is capable. I excitedly told some friend about CarO and they dismissively said that Torque does all of the same things. It turns out there is a plug-in that allows you to use Torque as a dash cam, but it does not seem to have many features. Also, I found another app named Dash that seems to have even more features than CaroO! Can the cam apps record at the same time you're using the phone as a GPS with an app such as Waze? Yes! In fact CaroO gives you the ability to set two buttons to open apps of your choice. Many people set at least one of these to some sort of map or GPS program. All of these will record in the background, so you can have whatever app you want running in the foreground. I was hoping these would run in the background. I'm looking to use my Samsung S7 Edge as a dash cam. Most cameras in Samsung higher-end phones are better than most dash cam's. Only complaint of course is the night, when I do most of my driving, I hope these apps can adjust exposure, that way I can get more detail at night (i do have HID front lights, so that will help). Actually, the Mobius Action Cam has a Dashcam Mode and does an excellent 1080P Video. Costs about $70 on eBay. It's amazing how much the prices have dropped in the last month even. If you search eBay, DealExtreme, or even AliExpress, there are deals to be had. Do the research first though, as there are no major electronics players in this market yet, so there are some shifty ones out there. Don't be surprised if this becomes standard equipment on cars in 2-3 years. Anything that'll save insurance companies money usually does. Okay.Static tested the three dashcams. I like the caronroad.Good quality,easy to use,and camera reverses-front to back. Great for narration. The CarO was totally unsatisfactoury,and autoguard tries incessantly to sell the pro. These two I removed from my phone. (Motorazr M). I put my sisters phone number in it as opposed to 911. Question;how can I load the videos to my PC? I have storage set to ext.SD. I live(with five cats)in amotourhome-caravan,I believe you Brits call it,and travel a lot. I have an HD dashcam installed,this will be a nice back up. That's why I liked CarOnRoad as well - dead easy to use. Connect your phone to your PC like you would normally and use Windows Explorer to navigate to where the video is stored. Then just copy, or cut, and paste it on to your PC's drive. The video will lack the extra information that you see when viewing it on the phone. It'll just be raw video and audio. I'm actually Canadian, but we do have a lot of Brits writing for us. They took pity on this Colonist and let me join their ranks! ? Are you guys mistakenly talking about the CamOnRoad, or just trying to confuse the readers with all this talk of CarOnRoad? Can any/all of these programs write to an external card? Can you set a limit on how much memory is used? Will any of these run on an old version of Android? I've got an old Razr Droid X that might make a good dash cam. I was able to set them all up to write to a microSD card in the phone. It's pretty easy to do, really. If I recall correctly, you could set a limit as to how long the video was in all of them. I think you could set a total memory limit as well. I do know the paid versions had that for certain. You may be able to run these on older Android versions. The best bet is to check the developer pages for that information. Or download the trial versions and just give it a go! I would be careful as some police do not take well a screen visble to the driver other than the windscreen. That's true. There are some places where you can't have anything extra attached to windshield, as well. I tried the phonecam idea for a while, but I bought a real camera in the end. It cost 100 UK pounds, neatly fitted so the wires were hidden. The greatest thing about it is you just forget it is there. It comes on with the ignition and runs about ten minutes after I turn the key off. It overwrites old files once it has filled the SD card leaving me with the last 5 hours of driving recorded. I can even set it to motion detect when I park the car. I think the problem with the smartphone solution is that the day you need it is that day that you forget to set it up. In the UK we are not allowed to see the screen on the back of the camera. It would be useful if these apps could turn the screen off while recording as it is this that is using all the power that might overheat the phone. You only need the film after something has happened or after you have driven somewhere nice to look at. My camera has none of the other uploading, WiFi, Blutooth tricks that the software has, but you soon tire of it. All you really want is reliable video recording. Finally, I know this was a test, but I think a dedicated car charger for your phone would be better than using its mains charger with an inverter! All of the apps would continue to record with the screen turned off. And you are correct, a dedicated charger would be better. I am replacing my Moto Razr with a new phone next week. Can I use the Razr as just a dash cam without needing a data plan from carrier? That way it offloads some application from my new phone. Just curious. I was wondering the same. Anybody know this? Yes you can, I'm using my old Rezound right now after reading this article. You will need to have WiFi to get the program downloaded, but after that the only thing you need is your GPS and a mount. Using an old phone is a much better solution than throwing my Note3 on my dashboard lol I have heard that the sun beating down on the phones will cause damage over time. Any dash cam app for iOS? I've used Dashboard Cam https://play.google.com/store/apps/details?id=com.busywww.dashboardcam for several years originally with My HTC EVO 4G. The author has updated it a fair amount and listened to feedback. I tried other apps back then and this was the best I found (and inexpensive). I haven't searched for a new app recently, but might give one of the above a test. I have a OBDII reader and use it with Torque already. Care to share more on how you like Torque with the OBDII reader? Do you find it useful or just interesting? I tried using my phone with apps other than these, I have a good quality phone a Samsung Galaxy S4, I found that having the camera on all the time, with the sun beating on the phone, would cause the phone to over heat, if plugged in I would get errors that the battery was too hot and charging had been stopped. I opted for a $20 dash cam on ebay, it was a much easier answer. I heard good things about DailyRoads, but just couldn't get it to work on my phone. @Dexter, in the time it took me to do my testing and write the article, I've seen decent quality dash cams drop under $100. Or you can just buy a real dashcam! We could, but a good one is expensive and $3 beats $500 any day of the week. I fully intend to have a real dashcam some day, but in the meantime, AutoGuard works really well for me. Can I have your mail address Urgent request? If you have a question, we can't answer those through e-mail. Post your question here, and I'll do my best to answer it. You can set AutoGuard to only charge when docked so it doesn't charge for any charger input. Thanks for the article, going to check out CaroO to try out the record automatically when I start driving. The AutoGuard community is a real plus. That's a good indicator of how long the app will last and how it will develop.